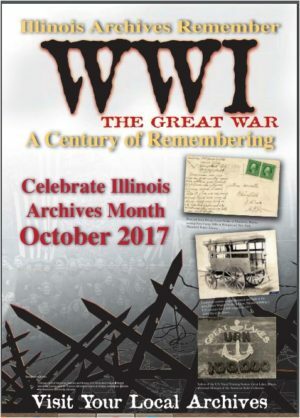 “A Century of Remembering: The Great War” is the theme of Illinois Archives Month (October) 2017. World War I affected every aspect of American society, and is documented in many different ways in archival repositories across the state. The Frances Willard Memorial Library and Archives offers this brief overview of the role played by the Woman’s Christian Temperance Union. In 1913, the Peace and International Arbitration department of the Woman’s Christian Temperance Union (WCTU) declared that “This world was never so near as now to the glad day when the nations shall beat their ‘swords into plowshares and their spears into pruning-hooks’ and shall ‘learn war no more’” (1913: 376). The following year marked the beginning of World War I in Europe. Before the outbreak of the War, the WCTU distributed literature, published songs, circulated petitions, and hosted sermons and lectures to promote alternatives to armed conflict. As Europe plunged deeper into the Great War, the WCTU continued to hope that, by witnessing war on such an unprecedented scale, the world would come to realize that “there is a better way of settling difficulties than by cruel carnal warfare” (1914: 304). However, WCTU women did not hesitate to support relief work. Rather, they approached their involvement in World War I as an opportunity to demonstrate the power of peace and justice against “selfish and autocratic power” (1917: 45). In 1916, the National WCTU praised its European counterparts (the World’s WCTU) who aided soldiers and families, noting that “with tender compassion women bind up the wounds that are made by war” (1916: 111-112). When the United States entered the War in 1917, the WCTU rose to the occasion, declaring that “all women in our republic are called to the colors… We are patriotic first, last and all the time” (1917: 84). WCTU membership surged, as women sought out the WCTU as a means by which to contribute to the war effort (1917: 96). 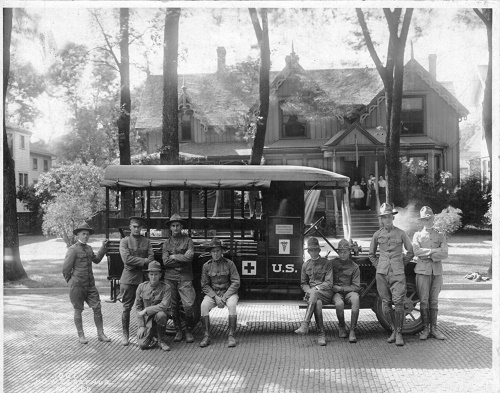 The WCTU raised money to purchase Liberty Bonds and to send ambulances, clothing, and “creature comforts” to the front (see image), and to support French and Belgian war orphans (1917: 85). It furthermore engaged in educational and social work in camps and hospitals (with an emphasis on refraining from alcohol), and organized welcome celebrations for America’s “returned heroes” (1919: 78). The WCTU referred to its relief efforts as “organized mother love” (1917:142-143). True to its core mission, the WCTU continued to advocate for prohibition throughout the course of the war. The temperance campaign took a new tack in light of food shortages and conservation policies, since the manufacture of alcohol required grain and other products that should be used to produce nourishing foods. “Do not blame us,” declared the WCTU, “if our woman soul is tried and our woman brain fails to comprehend why the powers that be continue to waste enough food stuffs daily in the manufacture of beer to send to our enlisted men and the allies 6,000,000 loaves of bread” (1917: 86-87). Additional sources in the Frances Willard Memorial Library & Archives include: Union Signal newspaper; subject and biographical files; state WCTU annual reports; World’s WCTU reports. This entry was researched and written by Willard Archives volunteer Marie Peeples.